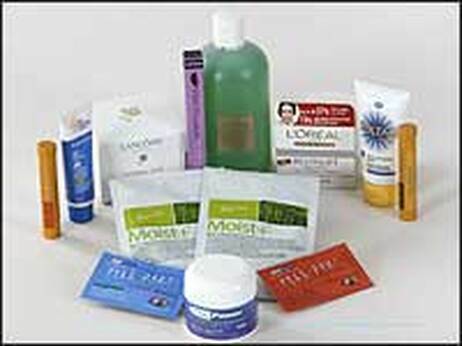 Anti-aging cosmetic creams are used to lift and tighten skin on the face, neck, and chest. Lancome uses microlifters to deliver an instant lift of the skin. Microlifters are made of Nano-particles such as silica and proteins to fill the mesoporous structure that is the skin to lift and re-tighten the skin. Other products like L'Oreal Revitalift Double Lifting use proprietary nanomaterial formulas to create flexible networks to instantly re-tighten the skin. In addition to creating skin tightening networks, L’Oreal RevitaLift Double Lifting uses a second formula to fight wrinkles. Nanosomes are used to encapsulate and transport concentrated oil-soluble active ingredients, known as lipophilic active ingredients, into the skin where it can fill the mesoporous skin structure, increasing the effectiveness of the product. Due to the potency and method of delivery of nanoparticle skin creams, the user experiences immediate improvements in the tightness and smoothness of the skin. Results are often seen after two or three treatments and can last for weeks. The functions of these nanomaterials in cosmetics is to reduce the appearance of aging and fill in fine lines and wrinkles. The nanotechnology used in the anti-aging creams allows for a cost effective treatment that yields immediate and long-lasting results for the consumer. These creams and treatments are a substitute to surgery and other more extreme cosmetic and aesthetic treatments. The research of novel nano-particles is limited. When particles decrease in size they can sometimes develop different chemical properties, creating some concenr about the long-term safety of highly engineered nanostructures like the ones used in anti-aging skin creams. the small aspect ratio of the materials in the creams is driving studies to determine the fate and transport of the materials in the human body. The FDA does not investigate cosmetics until complaints or concerns arise after these products have hit the market, leaving consumers to rely on the companies that produce the products to ensure they are safe. Additionally, little is known about how these materials interact at when released into the environment.